Konnan & B.G. James & Ron Killings b Todd Sexton & C.B. Cane & Delirious..
David Young b Two Face (Barry Buchanan?).. Julio & Alexis b Altar Boy Luke & Daizee Haze (Luke injured off the start to end match in one-minute)..
TAG TEAM TITLE CAGE MATCH: America's Most Wanted defeated Elix Skipper & Chris Daniels to win the titles! 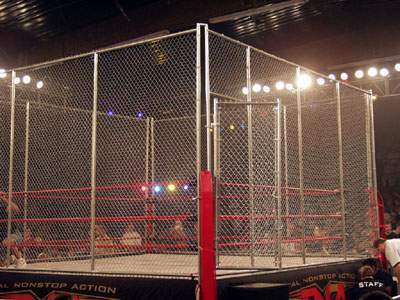 This is the first cage match in the history of NWA TNA, and it's pinfall/submission rules..
James Storm & Chris Harris got brutally busted open very early in the match..
Chris Daniels did a downward spiral off the top rope on James Storm..
Elix Skipper tried to climb to the top of the cage but James Storm powerbombed him!! Chris Harris speared Chris Daniels (standing at middle of top rope) off the top ropes! Elix Skipper did an AMAZING crossbody off the cage onto James Storm for a near fall..
Elix Skipper tried to climb up again, but James Storm knocked him over the top, falling to the floor! Chris Harris botched the "Death Sentance" finsher onto Chris Daniels..
Elix Skipper tried to climb back into the cage, but James Storm knocked him back down..
Chris Harris & James Storm finished Chris Daniels off with the "Death Sentence" off the cage! America's Most Wanted recapture the NWA World Tag Team titles! IN THE RING/CAGE: DLo Brown & AJ Styles..
DLo Brown came out and got into the cage and called out A.J. Styles for a World title match..
AJ Styles came out and they brawled for a few minutes and then order was restored and a match began..
WORLD TITLE CAGE MATCH: DLo Brown defeated AJ Styles by DQ when Vince Russo interfered..
DLo Brown was on top of the cage ready to do a splash when Vince Russo interfered..
AJ Styles through a cage up at DLo, knocking him back down into the ring..
AJ Styles used a baseball bat on DLo Brown and they double-teamed him..
Jeff Jarrett ran out with a guitar for the save but two red-shirt security guys blocked him from getting in the cage.. PARKING LOT: Shane Douglas & Julio Dinero & Alexis Laree..
Shane Douglas attacked Julio Dinero & Alexis Laree outside of the building..
Julio Dinero missed a superkick on Shane Douglas, and accidentally hit Alexis Laree! Shane Douglas entered the building and demanded a microphone and went up to "the pirch".. THE PIRCH: Shane Douglas + Glen Gilbertti + Raven & CM Punk + Jeff Jarrett..
Shane Douglas started talking about when he threw the NWA belt down in 1994..
Shane Douglas said he saw Raven in TNA trying to resurrect what he destroyed 9 years ago! Shane Douglas wanted to come in but the TNA officials wouldn't return his calls..
Shane Douglas said he made a deal with the devil (who turn out to be James Mitchell)..
Raven walked straight up the steps to Shane Douglas and began brawling! Shane Douglas, joined by Glen Gilbertti, took out Raven and C.M. Punk..
Jeff Jarrett entered the scene with a steel chair and saved Raven.. LIGHTS OUT MATCH: Jerry Lynn pinned Justin Credible.. The lights went out in the arena, signifying that the next match is not an NWA santioned match..
Jerry Lynn & Justin Credible brawled outside in the parking lot near a highway overpass.. They made their way into the building, around the TNA dancer cages..
Lollipop fleed her cage, and tripped, and Jerry Lynn got up to check on her..
Justin Credible hit Jerry Lynn from behind, but Lynn fought back and pinned Credible on the stage! After the match, Justin Credible handcuffed Jerry Lynn to the dancers cage, then gave him a series of chairshots! BACKSTAGE: The Group With No Name (formerly S.E.X.).. The story here is that Vince Russo trademarked the S.E.X. name so S.E.X. is now without a name.. The S.E.X. members are no longer allowed to wear the Sports Entertainment Xtreme shirts..
Glen Gilbertti gives everybody a pep talk and said he wanted Shark Boy's mask.. NON (X) TITLE MATCH: Frankie Kazarian pinned Chris Sabin (X-Champion)..
INTERVIEW: Goldylocks & Shane Douglas..
Shane Douglas is steaming of Jeff Jarrett sticking his nose in the Franchise's business..
Shane Douglas challenges Raven & Jeff Jarrett to a match later tonight against he and Glen Gilbertti.. MATCH: Kid Kash pinned Erik Watts when Abyss interfered..
INTERROGATION: Konnan & Ron Killings with B.G. James..
Mildly funny segment with the usual insider humor about Juventud Guerrera and others..
OUTSIDE: Shark Boy & New Jack..
Shark Boy is sitting in a kiddie poor, which is supposed to be his "Shark Tank"..
New Jack tells him that he will not get in there with him! Shark Boy shows New Jack a new game, of throwing rings onto the arms of an inflatable octopus..
New Jack sits down in the Shark Tank and throws the rings at the octopus..
HARD 10 TOURNAMENT MATCH: Sandman defeated Sonny Siaki (11-9)..
Sandman came off the top rope with a Senton through a table at around the 5 minute mark..
New Jack came out (will face Sandman in finals next week) and drank beers with Sandman..
INTERVIEW: Goldylocks & Raven / Jeff Jarrett..
Jeff Jarrett expresses his concern on whether or not he can trust Raven tonight..
Raven said as long as he doesn't have to worry about JJ stroking him from behind, they'll be okay..
OUTSIDE: Shark Boy & Mike Sanders..
Mike Sanders is dunking Shark Boys head underwater and then beats up on the inflatable octopus..
Editor's Note: He didn't even try to take the mask, so what's up with that? INTERVIEW: Goldylocks & Sonny Siaki + Trinity..
Sonny Siaki tells the world that he has aligned himself with AJ Styles & Vince Russo..
Trinity then entered and choked Goldylocks out!!! MAIN EVENT: Jeff Jarrett & Raven beat Glen Gilbertti & Shane Douglas via DQ..
Raven did a plancha at the start and acted like he twisted his ankle and limped for 10 minutes..
Jeff Jarrett whacked Glen Gilberti with a guitar and made the cover..
Embarassing moment where Shane Douglas was SUPPOSED to pull the referee out after the 2-count..
Shane Douglas was way out of place (or just forgot) and the referee pretended to be pulled out by the Invisible Man! James Mitchell showed up and threw a fireball at Raven to result in a disqualification!